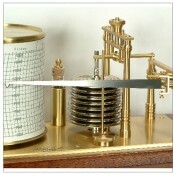 A barograph is a recording aneroid barometer where the changes in atmospheric pressure are recorded on a paper chart. The recording chart is mounted on a drum which is turned by a clock. The measuring element is a set of seven aneroid capsules with a diameter of 62mm. The influence of temperature on the capsules and the transmission system is compensated by a bi-metallic strip across the whole measuring range, that is for temperatures between -30° and 40°C (-22° to 104°F). The Norfolk and The Blakeney barographs both have mechanical eight-day clocks with a seven-day chart which covers one full rotation of the drum. The ink trace, or barogram, on the recording paper is a visual record of changes in pressure and the trend shown can be an invaluable help in forecasting changes in the weather. Each instrument is hand assembled and then tested and calibrated to a standard chart in our own pressure/vacuum chamber. See also Meteorology for marine and other industrial barographs. A pack of charts covering 2 years and ink is included. Replacement charts, stainless steel or disposable fibre nibs and different colour inks are available. Charts are available in inches or millibars, starting on a Sunday or a Monday. Full details of all our charts can be found in our specification table.